Gail Rubin is not only an author, columnist, and radio/television host, she’s The Doyenne of Death®. As a Certified Thanatologist (death educator) and a Certified Funeral Celebrant, Gail brings light to a serious subject, helping others plan for the inevitable as well as remember the lives of loved ones. 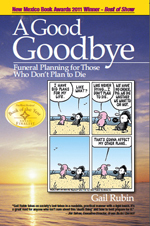 Her award-winning nonfiction books published by Light Tree Press include A Good Goodbye: Funeral Planning for Those Who Don’t Plan to Die (2011) and Hail and Farewell: Cremation Ceremonies, Templates and Tips (with Susan Fraser, 2015). 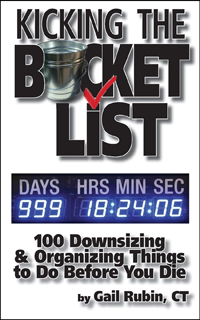 Her newest book, Kicking the Bucket List: 100 Downsizing and Organizing Things to Do Before You Die, was published by Rio Grande Books in 2016. You can find Gail on her websites AGoodGoodbye.com and GailRubin.com, and on her Amazon author page. What’s your elevator pitch for Kicking the Bucket List? Kicking the Bucket List is two-thirds about downsizing and one-third about organizing for end-of-life issues. We’re more inclined to deal with our material goods than our mortality, and this book helps get the conversation started. What unique challenges did this work pose for you? At first, it seemed like coming up with 100 items for this particular Bucket List was going to be a stretch. It turned out I had to pare down and combine items to make everything fit. Each item needed a photo or other artwork. I found a great resource for free Creative Commons images at Pixabay.com, and I took my own photos around the house of my own junk and my cats. How did the book come together? Barbe Awalt and Paul Rhetts, the publishers at Rio Grande Books, have published a series of Bucket List books since 2015. It started with Barbe’s The Basic New Mexico Bucket List: 100 Things to Do in New Mexico Before You Die. Each bucket list item has one page, with a paragraph or two of description, a link to a website for more information, and a color photograph. By the time Barbe approached me about doing a book for the series, other titles in the pipeline focused on hot air ballooning, cowboy life, space buff activities, and other New Mexico topics. This was the first of the books to focus on a practical issue everyone will eventually face. We met to discuss the book in August of 2015, and signed a contract in September. I first focused on doing an outline of tips that went from “why downsize” to “how to downsize” to “creative ways to downsize” to “organizing for end-of life issues.” Once I started the writing, found appropriate website links and gathered photos, it came together within three months. Paul said the editor commented this was the most polished manuscript she’d ever seen, so the editing process didn’t take long. I thank my critique group for helping make it so polished. And we have SWW member Steve Brewer to thank for the title. I believe alcohol was involved. What was the most rewarding aspect of writing Kicking the Bucket List? As a professional speaker, the book has given me a new way to speak about mortality issues. I now have a PowerPoint presentation with photos from the book that I can customize to focus more on downsizing or on end-of-life issues, depending on the emphasis desired by the organization having me speak. The talks have been very well received, and I’ve sold a number of books after these presentations. Do you have a favorite quote from the book you’d like to share? How many of the 100 items from the list have you checked off? You would think The Doyenne of Death® would have completed all of the items, but no, I’ve still got drawers, closets, shelves and rooms that have excess goods that need to go. I have done a number of the end-of-life organizing items, though. Any “Oh, wow!” moments while doing research for this book? Oh, wow—I still have a lot of stuff to get rid of. What inspired you to write about planning for death? I got married for the second time in 2000, and had a really creative and fun Jewish Western wedding. Everyone had such a good time, I wanted to write a book about creative life cycle events and call it Matchings, Hatchings and Dispatchings, about weddings, births and deaths. From 2006-2007, I did a monthly feature in the Albuquerque Tribune by that name, and it was the columns on death and funerals that got the most reader response. The responses told me there’s a real need to have conversations about death, and humor is a good way to start the conversation. I focused on funeral planning, since there were already plenty of books on wedding planning. The course of my career changed when I wrote A Good Goodbye: Funeral Planning for Those Who Don’t Plan to Die. I went from being a public relations professional to a Certified Thanatologist (a death educator), a Certified Funeral Celebrant, a licensed insurance agent, a very busy blogger/podcaster/YouTube creator, and a contributing writer for funeral trade press. How did The Doyenne of Death® come about? My brother Mitch suggested the moniker, and I thought it was great. It wasn’t until I ran out and spent a lot of money getting the phrase trademarked that I realized most Americans don’t know what a doyenne is, although Europeans are familiar with the term. So, in addition to being a death educator, I’m educating people that a doyenne is a woman who’s considered senior in a group who knows a lot about a particular subject. What marketing techniques have been most helpful to you? I do drawings at my presentations for a free book or the 4-DVD set of my TV interview series that incorporates information from A Good Goodbye. The information requested includes name, email, phone number, age, city and state. If they include their email, they are added to my email list. I also provide check boxes to indicate if they’d like more information on A Good Goodbye programs and having me speak at other organizations. I also offer several free documents on my website that people can access by opting in to my email lists. These include a 50-point Executors Checklist from Kicking the Bucket List, a free cremation e-book and a 10-page planning form from A Good Goodbye. Those offers help build my email list, which is almost 6,000 contacts at this point. Including lists or forms for download on the website was a must-have as I planned the marketing for the books. Visit my site, see what these forms look like, and sign up at www.AGoodGoodbye.com. You’re active in Toastmasters. How has participating in this organization helped in marketing and promoting your books? Being a good speaker is essential for writers to sell and promote their books. I joined Albuquerque Challenge Toastmasters in 2012, and it has made a huge difference in my competence as a speaker. I encourage all Albuquerque writers to visit our meetings to see how ABQ Challenge members help each other become better speakers. We meet on the second, fourth, and fifth Saturday of the month from 8:00 to 10:00 am (doesn’t conflict with SWW meetings) at Cooper Art Center (as in SWW’s Susan Cooper, the Queen of Mold). Learn more at www.ABQChallenge.org. KL Wagoner (writing as Cate Macabe) is the author of This New Mountain: a memoir of AJ Jackson, private investigator, repossessor, and grandmother. 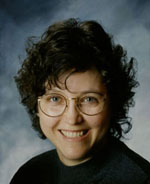 She has a new speculative fiction blog at klwagoner.com and writes about memoir at ThisNewMountain.com.